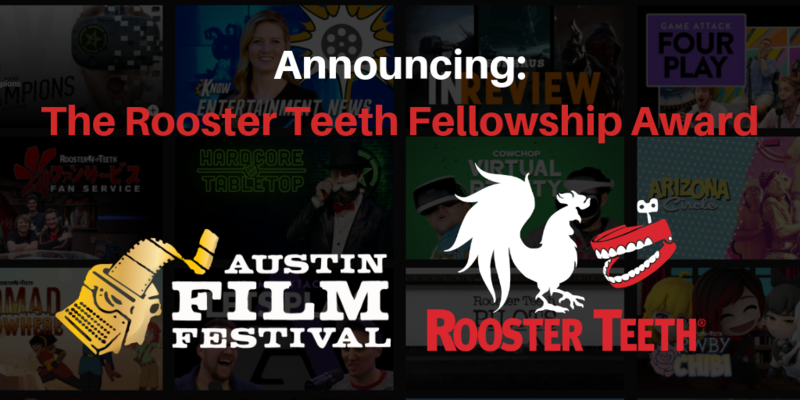 The Rooster Teeth Fellowship Award is open to original scripts in the following categories: features, TV pilots, digital series, and fiction podcasts. The fellowship will be awarded to the project that best fits Rooster Teeth’s voice by incorporating elements of comedy and genre filmmaking and accomplishing a low budget/high concept feel. Rooster Teeth is looking for stories about ordinary people in extraordinary situations, coming-of-age stories, and other engaging journeys of self-discovery. Austin Film Festival (AFF) is a non-profit organization dedicated to furthering the art, craft and business of writers and filmmakers and recognizing their contributions to film, television and new media. AFF champions the work of aspiring and established writers and filmmakers by providing unique cultural events and services, enhancing public awareness and participation, and encouraging dynamic and long-lasting community partnerships. This project is supported in part by the Cultural Arts Division of the City of Austin Economic Development Department and the Texas Commission on the Arts. Rooster Teeth is a pioneering media and entertainment company responsible for some of the biggest online series in history, such as the award-winning and longest-running web series, Red vs. Blue. They also produce the globally acclaimed animated series RWBY, the first western anime series to be distributed in Japan; the award-winning Rooster Teeth Podcast; and Immersion, a reality format that brings video game theory to the real world. Rooster Teeth has a massive global footprint of more than 45 million subscribers to its YouTube Network, 5 million unique monthly visitors to its RoosterTeeth.com hub and 3 million registered community members. The company was founded in 2003, and is a subsidiary of Otter Media, a WarnerMedia company.